In the Catholic Church in the U.S. Growing or Shrinking? Some surprising conclusions from CARA data. There are different ways of assessing the relative health or distress of the Catholic Church here in America. In yesterday’s blog we discussed some signs of vitality, in terms of both clergy and laity becoming more focused on the urgency of evangelization, and of personal conversion. There are many other ways of noting our strengths and struggles. One of the most obvious metrics is to look at the raw numbers and ask, “Is the Catholic Church in America growing or shrinking?” A recent article at the blog of the Center for Applied Research in the Apostolate (CARA) addresses this question, and I would like to present a quick summary of some of the findings. But at the end of the day I am also left with a fundamental question. The article appears on the CARA blog “1964,” and is authored by Mark Gray, the usual researcher and blogger at the site. He is critiquing a study released recently by the Public Religion Research Institute (PRRI), which seeks to make a case for “disappearing Catholics” in American culture. Mark Gray of CARA unambiguously states that the PRRI study is just plain wrong, and emphasizes that the Catholic share of the US population has remained relatively stable at about 25% (+ or – 3) of the US population. He further argues that, while some hold that we are retaining this percentage only due to immigration, the overall effect of immigration is far less than most people assume. The usual narrative, or “conventional wisdom” is that the Catholic Church has been hemorrhaging numbers and that massive amounts of people are leaving the Church, which is only being saved by the arrival of large numbers of Hispanic immigrants. But this “conventional wisdom” is largely set aside by the fact that foreign-born Catholics make up only 24% of the US Catholic population. Immigration from the south has also leveled off a great deal since 2007. Thus while immigration has contributed to the stability of the Catholic population percentage, it is not nearly the to the degree argued by many. Another largely overlooked factor in the stability of Catholic numbers, is the phenomenon known as “reverts.” The fact is, there is a lot of “coming and going” in the Church. And while much is made of those who go forth from the Church, (ca 12% of cradle Catholics leave), the fact is, many will go eventually come back. Currently there are some 5 million Catholics who describe themselves as “reverts,” i.e. those who have returned after a significant absence. The number of new converts is also not insignificant. 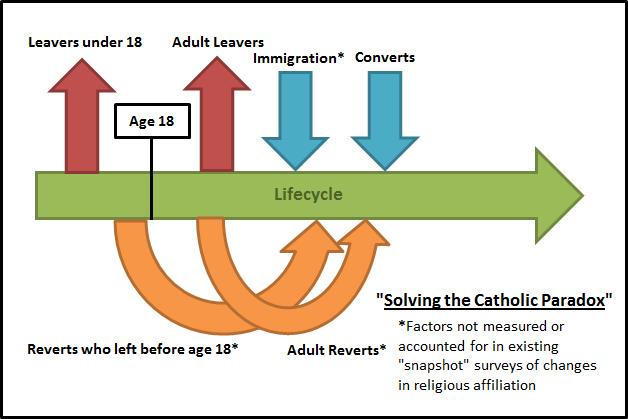 Gray therefore speaks of a kind of “life-cycle” that makes up the overall Catholic total of 25% of the US population (See diagram above from CARA). In this life-cycle, some go out of the Church, leaving her never to return. Others leave, but doing in fact return to the Church later in life. And to the number of returning Catholics is added the numbers of immigrants entering the U.S. Church, and those who convert to the Church later in life from other denominations, or from unbelief. This is a complex life-cycle which is not easily captured by many snapshot polls that observe only a moment in time. And while polls that depict the numbers of those who leave often make the news, the more complex numbers stretched out over the life-cycle of Catholic demographics, do not make the news and are not easily reduced to headlines. 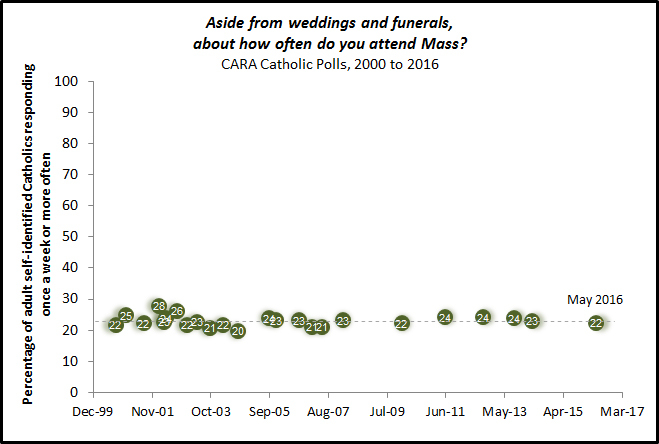 Gray has written elsewhere that Mass attendance has remained relatively stable at 25% of Catholics for over a decade now. And you can see that HERE. OK, so, according to Mark Gray and the data he presents, it’s steady as you go for the Church in the past two decades both in terms of our percentage of the U.S. population and Mass attendance. I have great respect both for CARA and Mark Gray, and have read their material over the years. I find a deep respect for the data at CARA and a distinct hesitation by them to spin the data for some cause. This is good scholarship and I respect it. But I do wonder how to square the data with my own experience as a priest. Of course my experience is only anecdotal, but it does join with the experience of many other priests and lay people I know. And my felt experience is that the Church is shrinking in many ways. As a youngster and even into college years I remember standing room only at most parishes for the principal liturgies. I remember full schools with waiting lists, and a kind of building boom as the Church claimed the suburbs. Now most parishes look to be significantly eroded here in the DC area. We have closed many schools and some parishes are not far from closure as well. According to our October “headcount” data, the number attending Mass in the past 12 years has dropped every year about 1% such that we have lost about 25,000 Catholics attending Mass overall in the DC area, though the population of DC has overall increased by about 13% in the past decade. Sacramental data, especially weddings have also declined over the last decades. Now, of course Washington DC and its suburbs is a small sliver of data compared to the overall national numbers in the Church. Further, one might reasonably expect that the forces of secularization would be stronger in what is both a large urban area, and which trends liberal. And yet, many other dioceses have taken to closing schools and parishes throughout the country and this too adds to the impression of a loss scenario, not a steady as you go scenario. But again, as Mark Gray points out, the bad news gets the headlines. So what are we to make of the national data and our local experience? Again, I trust CARA and Mark Gray is a straight shooter. But I am interested in your thoughts and even more your experience and actual data. I am struck by his observation that many “want” the Church to be losing members for any number of reasons and agendas. So before you or I simply say what we think, it might be good to check a few of our premises that might color how we see things. I personally experience a little disconnect with the analysis that Church numbers are steady, especially when it comes to Mass attendance and sacraments. But my sample is small: me and a few close friends and relatives. How say you? What is your experience? Is the Church in your area growing, shrinking or holding steady? Well, I’m in the Washington suburbs, too. The Diocese of Arlington. Strangely, we’re not declining slowly here at all. We’re creating new parishes, starting schools, and are ordaining on pace of about 4-5 men per year (not bad for a diocese with about 70 parishes, if you do the math over a priest’s career). Yet, it’s basically the same suburbs as the Archdiocese of Washington. As a purely coincidental side note, I’m sure, we have about a dozen parishes (15%) with a regular Sunday Extraordinary Form, quite a healthy number compared to our neighbor to the north. Not many altar girls, either. Hmmm…..maybe I should stop before I’m accused of having a bad attitude. I suspect that a lot of the reverts are coming back to the Catholic Church because they are disillusioned with Evangelicalism, which has shown itself to lack depth. I would like to know how the study identifies someone as Catholic… This could be the disconnect. If many don’t see the number of people in the pews that they used to see ( but the researcher says they are still there) maybe a good number of people he identifies as Catholic are nominal Catholics who don’t come to Church too often. I was thinking this too. We really need to look at the numbers of practicing Catholics, which I think anyone would define as those who attend Mass weekly. If the number is only 25% attending Mass each Sunday…well, that could explain what we see and experience, and what the official numbers say. Great point. I noticed this again and again during the recent election cycle when “the Catholic vote” was trumpeted to be 25% of the population, but how many of those are Catholics in more than name? Catholicism, unlike Evangelicalism e.g.,still maintains a strong cultural element. Cultural Catholics may not show up for Mass unless it’s X-Mas Eve (X-Mas itself is desolate) or Easter (the only times our parish is standing room only), but they still are counted in studies like this. I’d be interested in seeing the numbers of practicing Catholics (weekly Mass, Confession a couple times a yr, no contraception, profess and believe all the Church does, etc) relative to 50 years ago. The disjunction between practicing and cafeteria Catholics might account for the difference between “on the ground” experience and the raw numbers. Part of it may be what part of the nation one is in. For instance in New England the population as a whole is shrinking, not just Catholic population, due to both lower birthrates and people moving away. So churches are closing and things are empty. Down in FL I’ve observed multiple parishes in a close radius which have most masses near capacity. They are building new parishes to handle the increase. The key of what CARA says isn’t that the % of population thats catholic is steady, its just disputing if its all from immigrants. I’m curious too if CARA is right. Time will tell. I also think we tend to take for granted that just because an immigrant is Latin that they are automatically Catholic. In my own unscientific observations I am finding that many more Latin Americans (usually not from Carribbean nations) are starting to become Evangelical or Seventh Day Adventist or something of that sort. Plus, how can you even calculate the “revert” percentage since many of us come back without any pomp and circumstance (have already received the Sacraments of Initiation)? As I attend certain functions at my parish in NC I frequently hear the Northeastern accents and the usual reminiscing of snowy weather. I think, Monsignor, that you are not witnessing Catholics leaving the Church. You are witnessing Catholics leaving you. Numbers such as these should be considered. I know that as soon as I can, I’m getting the hell out of Dodge and not looking back. I attend services at a university parish on the west coast, and our Pastor told us on Sunday that our Sunday attendance is down 21% in the past five years. My experience is that there are fewer Uni students but also fewer adults attending Mass. I don’t know why. We hew to the spirit of Vatican 2 in terms of theology and liturgy but that has always been a drawing point for the non student segment of the parish, though perhaps less so for the students. There are just fewer bodies in the pews. I would suspect that few people would deny that however else one might characterize Church membership, cultural Catholicism has decreased drastically. Much of this has absolutely nothing whatsoever to do with what the Church teaches, does, or offers, and has everything to do with societal changes as populations have become more mobile and, hence, there are no longer the small, close-knit communities. It is not only parishes as community which have decreased, neighborhoods as community have decreased. Whereas once upon a time you knew and were friends with everyone on the block and the next block over, now people often do not even know the name of the person who lives across the street. Society has become much more secluded as a whole. And long gone are the days when a parent told their young child to go run around in the neighborhood and play without any supervision. Much of Mass attendance in the past hinged upon cultural Catholicism, going to Mass because that is what everyone as a community did, like going to Friday night high school football, but with a decrease of that culture, there is a decrease of the cultural activity of going to Mass, not to mention various devotional practices. Of course, back when cultural Catholicism was a reality, too often people’s faith was largely limited to the cultural, without the deeper spiritual and authentically sacramental aspects included. 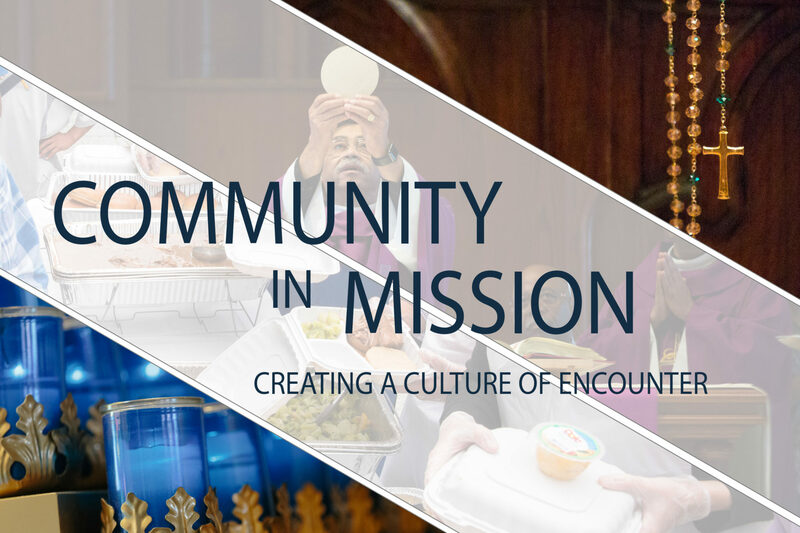 To that extent, one might think that there is nothing that the Church can say or do to improve the situation, at least not without restoring the sense of community to society at large. However, that is exactly what the parish church can offer that society at large no longer does — community, extended family, familiar friendly faces who then can become friends in addition to a familiar face. I have over forty first cousins. All raised Catholic. I am the only one who is a practicing Catholic (attends Mass weekly) and is raising her children as Catholic. It’s actually quite simple and I’m not sure why people can’t see it at this point. There’s a winning formula if you want to grow Catholic parishes and dioceses: on the one hand, boldly proclaim the uncomfortable truths of the Catholic faith (abortion, contraception, chastity for all, the need for Confession, fasting, etc.). If people want to be affirmed in the culture’s filth, they can find that literally anywhere else. The Church is attractive for being a different place, one which challenges the conventional wisdom and is interesting as a result. On the other hand, parishes that recognize that 99 percent of Catholics get 99 percent of their exposure to the Catholic Church in the context of the liturgy know not to waste that precious 50 minutes a week. They therefore have an “ars celebrandi” in line with the mind of the Holy Father. They “say the black, and do the red.” They promote beauty visually, audibly, and even in touch, smell, and sight. All the senses are engaged by the beauty of the Catholic liturgy. That means all the things you can read about online and which I won’t waste time repeating here. We all know what good liturgy looks like, and please don’t feign ignorance about it anymore–its been 10 years on the internet and growing. Do both these things, and you have lots of young families, lots of vocations, lots of donations, and you get to win. Try to conform to the culture in either respect, and you get to be an “Our Lady of the Suburbs” model of failure. We’ve all been to those parishes, and they are only useful as examples of what not to do. I think it relates to where your experience is located. You currently are involved in inner city parishes. Many inner city parishes are shrinking, much of the immigrant population that use to be part of the inner city parishes has moved out to the suburbs. Taking their place in general are people that are usually not Catholic (i.e. most African Americans) or Catholic but real low income (i.e. hispanics) so the inner city parishes are having a tough time surviving. But the suburban parishes are overflowing. Of course you will find people of all groups that break the stereotypes/trends, but that is what I have seen in both DC and Baltimore parishes. My wife’s parish in inner city Baltimore followed this same exact pattern. When she was a kid it was primarily Italian immigrants. Now it is mostly made up of a couple of the same families driving back for nostalgia reasons or a few that still live in the area, and the new hispanic population. Living in Texas, I can’t believe Obama won the election – nobody I see or know supported him. My friends in NY and California tell me just the opposite. POINT: making global judgements based on “small slivers of data” makes no sense. From my perch, the health of the Church mimics Mr. Gray’s assertion. More to the point, data analysis is collecting and analyzing ALL “small slivers of data” and extrapolating conclusions. I trust Mr. Gray. Is this the “crisis of faith” that B16 talked about upon announcing the Year of Faith? I think so. Modern culture demands a relativist take on society. There are no moral absolutes is what we are led to believe. I think your experiences are right on. People still identify as Catholic culturally but no longer attend Mass on a regular basis. I know because I was one of them. Cradle Catholic, altar boy, even thought about becoming a priest. Then I went to college and promptly forgot about my faith. I never actually disassociated myself from being Catholic. I even stubbornly held to the mantle as Catholic while attending a non-denominational church for about 6 months until I learned I was an idiot (upon watching as they distributed fake communion from a cardboard box top). Since that moment, I came back to my faith and haven’t missed a Sunday Mass since. But it wasn’t all roses in coming back. It took time to learn my faith better. And the more I learned, the more I realized how much I needed the Church. We live in a culture where Christians think it doesn’t matter what church you go to and faith is not familial, but merely personal. We reject what we don’t like and keep what we do. I call it billboard Christianity. Just look at how many advertisements you see for this church and that. Come here, we have music and Starbucks. Americans pick churches based on a consumerist attitude. Blessed Fulton Sheen once said that if you don’t live what you believe, you’ll end up believing what you live. So true! Americans expect the church to conform to them and not the other way around. As long as this mentality persists and we lack catechesis, Catholics will continue to reject the Church even though they identify with it because it is only the Catholic Church that refuses to conform to this fallen world. I am so thankful that I finally saw that. More Catholic schools in Youngstown, OH area recently closed. While the mid to early 1900’s may have not been perfect, Catholicism’s reach was so much greater. Who can get past the Protestant-like atmosphere at our schools and churches to see the value of the Sacraments? The Sacrifice of the Mass and all sacraments (respectfully) are like a car: just because it moves, it doesnt mean it is awesome. We need awesome, manly, mysterious, and powerful liturgies and rites to bring people Home. Period. May Mary protect and guide us to Her Son’s Will. In my parish the anglo population is visibly decreasing and aging. The hispanic population (also nonhispanic Asian population) is growing. I think part of the problem is a sort of “identity change.” In the late 60s, early 70s being catholic meant being white, having some measure of affluence, sending your kids to the parish school, and having a stay at home wife who came to school Masses. It meant something, I believe, to the folks who were able to enjoy this lifestyle, which at the time that I remember appeared to be the majority. (That majority did not include myself. As an Asian with two working parents who was not even (at that time) Catholic) I went to Catholic school but was emphatically not a member of the “ingroup” nor would I have been even if my parents did not work and even if I had been Catholic, since at that time the Catholic school had only recently been integrated, and I am dark skinned. However one blessing is that I did not expect to be a member of the ingroup, so it did not particularly bother me, as far as I recall. Part of the problem is that most Anglos cant afford the trappings of being in the Catholic ingroup anymore. It is expensive to be a member of the Catholic ingroup as it means being able to send your kids to Catholic school, go to Mass in the middle of the work week etc. The costs for being in the ingroup in a protestant church is much lower. No Catholic school, just show up on Sunday and volunteer. Nowadays, most Catholics fortunate enough to have a two parent family have two parent jobs. The parish schools are infinitely more expensive, and most people have trouble affording them. If your kids don’t attend the parish school, you are automatically in the non ingroup. If your wife can’t come to “hospitality hour” also usually in the middle of the work week or Bible study in the middle of the work week, again you will be excluded from most ministries. Folks who want the sense of belonging that they remember from their childhoods may have trouble finding it in their Catholic parish. Only a small sliver of Anglos can afford the cultural trappings of cultural Catholicism.And almost no Hispanics can afford it. This exagerates the feeling of downward mobility experienced by many Anglos (even before the recession struck in force). Me, I think the church should change her focus, and take their lessons from the Baptist schools, who have no trouble bringing people in. Instead of expensive parish schools run by paid staff, they should have Catholic formation in afterschool programs run by volunteers which all kids, PARTICULARLY the hispanics, the poor and those with uneducated parents, can attend.. This would return the focus of the Catholic schools to their original focus as a vehicle for raising up the poor, rather than being a hothouse for the wealthy. The emphasis should be tutoring kids to keep their grades up in the public school, while also teaching Bible and Catholic basics. There should be Mass or Bible study on Friday nights, with parents invited to attend. There should be Bible study on weekends to draw parents in. For myself, after my conversion to Catholicism I tried Catholic schools for one child and found the school both mediocre academically and stuck up socially. I have chosen to send my kids (both adopted, and both hispanic) to nonCatholic private schools as well as to public charter and regular public schools (gifted track). Thus far it is working out pretty well. They go to/went to Catholic youth programs and sacrament prep classes. . The oldest graduates from college in December, and the younger is in 9th grade in all honors or AP classes in public school where she has many hispanic friends and feels well accepted. Beautiful analysis you have here … I wish you could mail this to your diocesan secretariat – at least for information’ sake! Seeds are sown in different forms, and this could be the seed that would fall on fertile soil! Ohio-and the lay’s reaction and Vatican intersession-portrays the sadness of poor clerical leadership, the lay being “active”, and emasculation of the Faith and our traditions. We have become religiously weak. That draws no one to the Faith. I think that the regionalization of Catholic worship is worthy of deep research. Why is it that certain regions of the US (like here in the N Carolina) are experiencing tremendous growth, with standing-room only Masses, lots of active faith activities and communities (such as Cursillo, Cenacles of Divine Mercy, prayer groups, etc. Is there something about the economic climate of certain regions such as the NE or North mid-west that cause Catholics to give up on the Church? Is it political leadership in these areas? What about episcopal standing for issues and liturgical practices? Or maybe just the societal presence of active, enthused Catholics that is “like a leaven”–helping the overall community to grow? Perhaps by understanding these social dynamics better, the Church can help discouraged Catholics to get re-connected. First of all Grey estimates that 97 million Americans were “Catholic at some point in their lives”. Now that’s a figure that should make us all take a second look. Where have these missing millions been hiding? In plain sight. The presence of huge numbers of “Catholics” are unknown to – and therefore, not counted by – their local diocese because they have not registered or sought services, or in some other way, made their presence known. One way we unintentionally distort our situation when we do this kind of research is by starting with those who still hold to a Catholic identity rather than further back at the beginning with those who understood themselves to be “Catholic at some point in their life” as CARA puts it. The only way to really grasp our losses and gains is begin at the beginning. The vast majority of whom have been baptized (although not all) – baptism being the doorway into the Church. By Catholic, some of us really mean something else: those who are formally registered with their local parish or those who are “active” or only those who attend Mass every week or those who espouse certain beliefs or even vote a certain way. Which is when we start throwing around terms like CINO – meaning baptized Catholics who don’t fulfill our specific criteria. Per CARA, Catholics per parish in US – arrived at by taking national figures and dividing by number of parishes in US. At least in our area (a suburb of Seattle), the missing demographic is the millennial generation: the 20-somethings who should be getting married and starting a family. There was only one wedding at our parish this year (contrast to 20 weddings 4 years ago.) Probably less than 5% of our parish is in the 20-30 year old age bracket. I notice this acutely because I’m a 27-year old mom who has tried hard to make connections with Catholic peers through church, but I’ve really struggled to do so. One positive thing I can say, though: those few young adult Catholics I’ve found at church are usually REALLY motivated people who are genuinely trying to live out their faith on issues such as avoiding contraception, raising the kids Catholic, and embracing the faith in their daily lives. Now imagine the horror searching for a woman to court and marry. Keep up the faith, Sarah! Praying for you!!! Are there suggestions you may have to offer, something you can encourage the few to attract the many? The two pm, Sunday afternoon, Latin Mass I attend is holding steady or slowly declining. My mom’s parish, the one I used to attend, just ordained a new deacon. The Mass I attended last time I visited her had a lot of people there. The Church where I attend Eucharistic Adoration always has some people at Adoration and there are at least a dozen people there for Confession. I was raised by devout Catholic parents in the 50’s and 60’s. Two of my four sisters left the Catholic Church, joined Protestant congregations and now all of their children and grandchildren are Protestant. They take their religion very seriously and are very active. My three brothers stayed in the Catholic Church, but their children vary in their beliefs from atheist to practicing Catholic. My parents devoted their lives and made many sacrifices to raise well educated, devout Catholic children and would be surprised had they been told that the majority of their descendents are not Catholic. You mentioned anecdotal evidence about sacramental data — i.e., the number of weddings is down. On that same note, does the Church have data on the number of communion wafers produced or distributed, say, on a yearly basis? I don’t know if that data is even available, but I would like to learn it if it is available. Again, one wonders what time these unattended “weekday masses” might have been. Presumably not at – say 7pm when somebody other than stay at home mothers and retirees could attend. Me I never get to go to church on weekdays unless I formally ask for leave (as I do for high holy days). I leave the house at 6am and I return at about 8pm most nights. I am by no means unusual. This is the new normal for most people and my hours are a LOT better than they used to be. I think if the priest took off Monday, Tuesday and Thursday (he does need down time), but made a point of working Thursday days, Friday nights, Saturday and Sunday he might get more business. Folks who run other enterprises that are expected to take place in “leisure hours” arrange their business hours in this (or a similar) fashion and get better results. I believe you are not clueless!!! I noticed a number of Masses at 8pm in Spain – daily and packed. That’s about when most of them close from work. You could suggest that to your Parish council or priest – directly! Who knows? I also see a decline, especially in marriages and baptisms. I do see reverts and converts. My sense is that there is a direct correlation between the decline in attendance and in marriages, the lessening of belief in and respect for the Real Presence of Christ in the Eucharist, and the abysmal job of catechizing that has been done for Catholics in the past 40 years. We have untold numbers of cradle Catholics who know next to nothing about their faith, could not defend even fundamental tenets, and who panic when confronted with questions they cannot answer. This leads to doubt and then to leaving the Church. Read some of Scott Hahn’s discussions of how easy it was for him to capture Catholics when he was an anti-Catholic Methodist. I do see a resurgence among Catholics over 50. I go to daily Mass at 6:30, before I got to work, at a parish in McLean, and we have well over 100 in attendance nearly every day. Not everyone is a member of this parish (my home parish is 60 miles west) but we go there because we work nearby. I think those who do go to daily Mass are much stronger in their faith and can defend it more competently than the average Catholic in the workplace. Many Catholics who work with my wife at a school board office do not observe holy days, do not observe the Lenten fast, and could never explain many of the Church teachings. Again, their catechizing was abysmal. We are now reaping the rewards of that. I also see some parishes introducing adult education programs and the response is almost miraculous. In our parish, we just started the Bible Timeline program and the room is jammed. When we did a study of Introduction to The Devout Life, we had the same response. Nearly everyone is over 40. I am not surprised when Catholics come back to the Church when they are in their 40’s and 50’s. They come back at a time when they begin to not just only begin to bury their parents, but also begin to experience personal health issues, some even near death health issues, like the one I had during this recent past summer, and when you begin to lose your siblings and your friends. I know, I had to deal not just only with a very aging senior mother in her 80’s but having lost the man I love, who was only 46 when he had died suddenly, but my older only brother who was 64 when he had passed. Other then for an older sister who is 67 and I being 53, with just only neices and nephews, as well as grand neices and and grand nephews, other than for my RCC parish faith community, which has been a great source of strength for me, where I have many friends, I would be alone otherwise. This Thanksgiving Day weekend, I give thanks to God for my faith, it has kept me SANE during a very difficult time in my mid-life. I am convert to RCC I have lived in many cities around the us. and I now live in France. I go to Mass more than once week. I kept reading about “how nobody is going to Mass ” I kept wondering where this is. This last All Saints Mass was standing room only. On the other hand I’ve been told many times from young adults that grew up in seventies that they relize now little they know about their faith. This may bring back many that are in their 30 now and are beging to teach there children. I have all ways wonder how many reverts we have since for many all they realy have to do is go to confession. The Press wishes we (the Church) would just go away. So they don’t want to see how many converts we have. They like to say how many have left the church, but don’t want to know how many come back. My wife and I started our life together in the Crookston Diocese,(MN) 22 years ago and the parish we joined as Man and Wife has doubled in size. The parish has a new Church and School, and each year we have more and more in our RCIA and Reverts to the Faith. However this is due to our Diocese realizing in 1999 that Religious Formation classes needed to change, as many of our youth did not truely know what we as Catholics believe or how to defend their faith to those that would sway they from faith. Our youth program is pro-active and very engaging, they do not whine about the uninformed youth in the church. The kids started to learn how to pray through the sign of the cross and onto the Rosary, they are taught the Apologetics, why we call our priest father, absolution through the rite of reconciliation, hell and we do not worship Mary and why. The youth have endless retreat opportunities not only locally but throughout the Country, and they can go on a mission as we have a very active mission here in the United States and the world. This is the time they learn how to discern their life gift, through prayer, service, evangelizing and they learn how to be quiet and listen to the voice of GOD telling them how to use their gift. A Pastor once homilized about his vow to proclaim the word even if his flock has left him and the church, I assured him I would be there. Our Diocese has taken it on the chin for standing by the word of GOD, and there are consequences for turning to a full understanding of the word and not bending to the societal whim of the day. Yes you will lose parishners for being to Conservative and not all inclusive to the secular culture, you will lose them because you will not sign a petition to ordain women and because you question their use of social justice. However you will see a resurgence of faith because you live your faith in word and action, the children are better able to discern the Sacrament of Confirmation. wev would rather have a young adult with questions say no to the Sacrament than say yes and be that person that becomes a CE (Christmas Easter) Catholic or a CINO (Catholic in name only). This is not a call to an inqusition but in this year of FAITH should not all Catholics discern their faith and if it offends them to follow the churchs’ teachings, then by all means leave as no one is holding your hand to the fire. Oh and by the way, if the other Diocese in this State would have been as concerned about their faithful and the state of their Hearts’ they would have done as we have. Our State had a ballot initiative on the sanctity of marriage being of ONE MAN and ONE WOMAN, the five counties our diocese encompass’ had a support of the amendment of 69.7% the other five Diocese had a 71.1% non support of the amendment. We will never bow to secular pressure. May your journey with GOD be joyous and fulfilling. I have lived in various parts of the country and Mass attendance in DC is pathetic compared to everywhere I have lived…or even visited. Hardly surprising though when you think about the type of people who moved into the district over the last ten years. Not a lot of Catholic families will choose to move into a $400,000 two bedroom condo in a city with terrible schools. Very appealing to people who live a child free lifestyle however. So what do you propose? How do we evangelize to those child-free rich folks who have moved in and can afford those $400,000 condos, but who think they have little need or use for God? How do we remove the scales from their eyes so they can see how very necessary He is and, thus, they are able to make a truly informed and free choice to accept or reject Him, rather than having nothing to do with Him because they do not know Him, or because what they think they know is wrong? Msgr.Pope, i am 74 years old. we are registered and contribute at Our Lady of Sorrows Parish in Youngstown, Ohio. my experience of Church seems so odd to me. my reality of the Church wasn’t very real! i believe the Spirit has been the teacher of the truths of the Church in my life. the only way i know to make the Church accepted as the living, vibrant Body of Christ that it is, is to be the most loving person that i can be. our definition of loving is so subjective! after a thirty or so number of years honey-moon, bob and i had to face a number of realities. we had to learn how to communicate. not an easy task. we will continue to learn as long as we are here. in America, egos and poor communication are as common as weeds. that is why Christ gave us the Church. i believe that faith is truly a gift, offered to all, accepted by many. i believe that our priests are chosen and are such a blessing . i believe that the roots of the Church are so strong that no evil will overcome Her. I believe the battle is over and God won, and all i must do is be a good soldier . the order was to be one body and one mind, and with grace we can do that. our priest, Msgr. Polando , gathered us for adoration. the speaker, a Benedictine from Cleveland was pointing out how we uplift and bless each other when we gather together, when we spend time with one another. at our worship site there are few and nearly all are elderly. the children have relocated and are part of other parishes. three worship sites are in the parish. i am not concerned about where we worship, only that we do! we are so blessed with priests. they have so much responsibility. and i believe that God is really, really in control ! As a public high school teacher in Southern California for three decades I can tell you that the number of my students who are being Confirmed and otherwise “sacramentalized” is really on the upswing. They wear t-shirts that are pro-life, pass out tracts from Catholic Answers in San Diego, finger rosaries, and offer direct and clear answers to anti-Catholic remarks by “Calvary Chapel” kids. I sit back and thank God that my prayers are seemingly being answered. The CC is doing fairly well with keeping its members (69% raised Catholic still are) and 15% of those raised Catholic are now Protestant. Overall, 83% of those raised Catholic are still some kind of Christian, and 83% of those raised Protestant are still some kind of Christian. But Catholics are very bad at evangelism, and half of all Protestants who convert to Catholicism are back in a Prot. church within a year. This figure increases to two-thirds departure on a 5-year time scale before leveling off. this is a big part of why only 3 percent of those raised Protestant are not Catholic. Just a reminder- 15 % of those raised Catholic are now Protestant. But what about the unaffiliated? Well, 39% of those raised affiliated are now Protestant. And 6% are now Catholic. it’s also worth noting that this wave of immigration from Mexico to the United States is the single largest migration from one country to another in the history of the world. That cannot be reasonably downplayed, and it surprises me to see anyone say “only 24% is foreign born.” Are you kidding? That’s a lot! That’s really a lot! And don’t forget all the babies those immigrants baptized when they were born here- you count them as members of your church but how you not going to credit that to the boost you get from immigration? Second and third generation immigrant descendants bring the figure up to what you’d expect, over 40%. Correction-68% of those raised Catholic still are, and 3% of those raised Prot. are now Catholic. Previous PostPrevious A Call to Courage in a Climate of Crisis and Conflict. Next PostNext I Once Debated dismissed Maryknoll Priest Roy Bourgeois on CNN Here’s the Video.